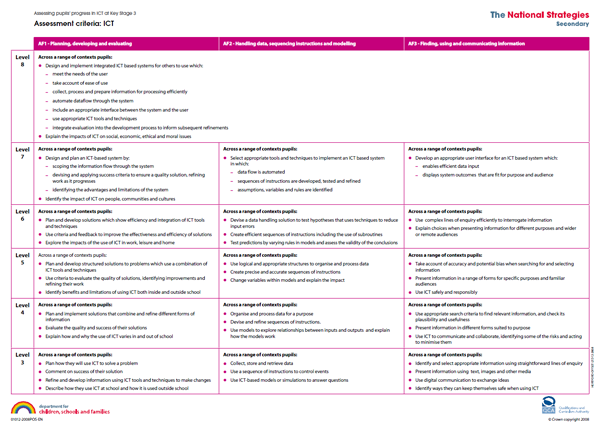 One of my department’s big focuses this year has been Assessing Pupil Progress, the new supplementary levelling structure for Key Stage 3. We didn’t have any idea what it was until our LA advisor, Pauline Hargreaves, gave us an excellent introduction to it in the Autumn term. For those who haven’t yet got to grips with it, APP divides the curriculum into three distinct fields called Assessment Focuses. AF1 is planning, developing and evaluating, AF2 is handling data, sequencing instructions and modelling, and AF3 is finding, using and communicating information. Doing this allows departments to assess students’ ability across a wider range of skill sets, as well as enabling them to review their curriculum to identify any potential weak spots. Without covering each of these fundamental areas in ICT, how can we give a realistic level by the end of the first term of year 7? The real draw, here, is that it offers a far more robust system of assessment than the old (or, indeed, the new) level descriptors. I always felt slightly uncomfortable when explaining the use of these to new year sevens: “If you do some of these things you’re a level 4c, if you do most you’re a 4b, if you do all of them you’re a 4a.” The sea of blank faces was always more than a little disheartening, especially when we did all we could think of to ensure they were as accessible as possible – 16 foot posters up in each ICT room with the descriptors in as close to pupil speak as we could get them, etc. The real point of the division of key competencies hit home when I thought back to teaching a mildly autistic boy in a previous school who was a marvel with anything logical. He could intuitively work his way through some fairly complex spreadsheet work (goal seek, pivot tables) on his own, yet when asked to explain it, or design anything creative, you wouldn’t think the work was from the same year group, never mind the same student. He ended KS3 with a high level 6 based on the quality of his work in Excel, Access & Scratch, which of course fed in to KS4 predictions. He was placed in a top middle set which was completing OCR Nationals with a significant emphasis on graphics, which – of course – led to his grades falling like a rock. ICT is an intrinsically broad subject, but I think the three assessment focuses identified in the APP model cover everything nicely. Some students will excel in one particular area more than the others, and being able to identify that early means we are better able to nurture those skills, and use this data to inform setting & course choices in the current/next key stage. At my school we currently only offer the OCR Nationals at KS4, and while they have their faults, they do at least offer a breadth of choice lacking in the majority of GCSE courses. I opted to teach (the wonderful) Unit 8: Innovation & e-Commerce to my top sets (1 & 3) for their second year. The course is largely essay-based, with a good deal of crossover with Business Studies, and radically different to everything the students had learnt in ICT thus far. The majority of students in the top set took to it very well, being perfectly well-equipped with the literacy skills to express their opinions on complex topics like legal, moral & ethical issues in ICT, or the impact ICT has had on society. However, several students in set three who had been working consistently to distinction standard in units 1 & 23 started to struggle significantly with the essay assignments. This might all sound off-topic, but my point is this; students who excel in KS3 at finding, using & communicating information would be logical choices for an essay/report/presentation-based course. Students who excel at sequencing instructions and modelling would be well suited for a data manipulation/programming course, and students who excel at planning, developing and evaluating should be good at handling larger database/spreadsheet projects. Being armed with such information when students arrive in KS4 would better equip teachers & students to choosing the best possible programme of study. Without needing to start an in-depth review, I knew our weakest area was AF2, with only a scant look at spreadsheets that goes as far as IF statements (which is further than we’re required to go by the OCR Nationals coursework, incidentally), an introduction to (flat file) databases, and a lacklustre Flash unit. The curriculum was very AF3 heavy, which was no huge surprise as literacy levels are quite low for new arrivals in KS3 – when I wrote the year 7 SoW I wanted to ensure we were discouraging the copy & paste mentality, so spent a good deal of time hammering that home. One year on, with a reasonably coherent scheme of work for our two-year Key Stage 3 borne out of hard work on the part of the department, I went to a subject leader network meeting where David Luke, the other Kirklees ICT advisor, put forward the idea of changing Key Stage 3 from the approach taken by many (including us) of half-termly topics on “spreadsheets”, “presentations”, “desktop publishing”, etc, that led to year 7 students learning how to use a piece of software, then leaving it behind them for a year until they came back to it in year 8. Instead, taking a more holistic, project-based view of topics would ensure that students are revisiting key competencies regularly, building up their skills in gradual steps once per half term rather than great leaps once per year, and coming to see that pieces of software shouldn’t be pigeonholed applications that you use on their own, but that the best possible pieces of work combine many different tools. One year 11 student recently gave a truly outstanding presentation on e-commerce in which he hand-crafted icons to represent the key points of his talk in Illustrator and included a short movie – worlds away from bullet point lists & clip art. As a department, we agreed that presenting students with the A3 assessment grids would be over facing, and counterproductive. Our resolution was to take appropriate descriptors directly from the APP grid and set them as success criteria for project work. We maintain the overview of the curriculum, and students are getting the focus throughout their project, but without having to digest the glut of information on the assessment grids. Teachers would then have short, individual talks with students at the end of a project after assessing the work to discuss how they think they’ve done, as well as setting targets for the next unit. I’m champing at the bit to start the overhaul of our curriculum, and now I have the cornerstone. APP is a solid foundation upon which to form a programme of study that can shape what our students learn, and how they learn it from joining the school to leaving. By involving feeder primaries, sixth form colleges and the students themselves, I hope we’ll have the makings of a truly solid scheme of work with the flexibility to keep it relevant & the robustness to ensure it lasts. Hi James, I have developed a spreadsheet to assess APP. If you send me an email I will send you a copy, you might find it useful. James, I have also developed a spreadsheet to assess APP, sounds similar to another post. Lets share. All of us have some pretty cool ideas. I am speechless. This is a fantastic blog and very engaging too. Excellent work! That’s not really much coming from an amateur publisher like me, but it’s all I could think after diving into your posts. Hi – i am currently looking at APP and starting to develop a spreadsheet too and pupil friendly assessment sheets – would love to see others to help. If you wouldn’t mind e-mailing them to me too? Currently looking at a better way to assess APP and would greatly appreciate a copy of the mentioned spreadsheet to work from.